Aaron, Avika and Patricia say that with all the action in Part 2 the Harry Potter series ends with a bang. Victor, 18, recommends Bad Teacher for a good laugh. L.A. Youth writers give thumbs up to Britney Spears, Sufjan Stevens and The Script. Camille, 14, was awed by Tim Burton’s creative mind. These are letters we received about stories that appeared in the March – April 2011 issue of L.A. Youth. Essay contest winners wrote about wanting to go to a Justin Bieber concert, visiting El Salvador and sneaking out. I want to be one of the screaming girls. Screaming for an encore. The most important event on my summer wish list is going to a Justin Bieber concert. I have never in my life been to any concert and it would be an honor if my first was Justin Bieber’s. I want to be able to meet him, hug him, touch him and even take pictures with him. 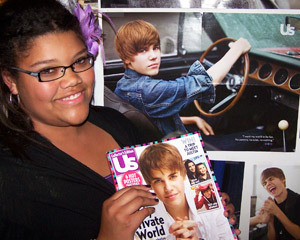 I have entered many online contests to attend a Justin Bieber concert, but have never won. Now I am praying that the recent contest I entered will be the one I win. My friend told me that he was going to take me to a Justin Bieber concert, but with my friend I never know. My heart is set on attending a Justin Bieber concert. I actually believe I would “die” if I never got the chance to meet him. I need to. I have to. I can’t continue to live unless I do. I have dreams about meeting him and I always think that I am going to be calm and cool and that I am not going to cry—just be friendly. But I know I’m going to be one of those crazed fans, only screaming and crying. Justin Bieber is my “drug.” I am like one of those alcoholics who if one day they have no alcohol, they go crazy, but with me it’s with Justin Bieber’s music. If I don’t listen to it every day, I go crazy. I have all of his songs on my iPod and if I don’t hear his voice every day, I’m nuts. He’s my drug. He’s my air. Without him I can’t live. I really hope that after this summer, I can finally check “Go to a Justin Bieber concert” off my list of things to do. I have so much that I want to do and I know that this one is the most important. There are so many things I would love to do this summer. A lot of exciting things, like skydiving or climbing the highest mountain. But at the top of my list is something very special to me. I would love to spend my vacation with my family in El Salvador. It’s been a long time since I was back in El Salvador. The last time I went, I was in third grade, six years ago! I love it over there, it feels right. It feels like home. All my cousins live there. My aunts, uncles and my grandpa and grandma. There are so many things to do with so much family around. The possibilities are endless. One thing I really want to do is go to the beaches. I’m not really into beaches, but the beaches are just beautiful in El Salvador. The water is just the right temperature, nice and warm. The sand is full of tons and tons of starfish. I love chasing crabs around after the sun goes down. It makes the beach that much more fun. You can’t do all of that in L.A.
There’s so much sightseeing in El Salvador and I would love to see it all, but that’s not my main purpose for wanting to go to El Salvador. Don’t get me wrong, I would love to go out and all, but I really would like to spend time with my grandpa. I love my grandpa so much and he’s getting old so fast. I’m scared to think about all the things that could happen to him. So before anything does happen, I want to spend time with him—sit and talk and reminisce about the old times. So between all the fun things I could do, I will always choose family. My grandpa means a lot to me and if I had one wish for summer, it would be to go to El Salvador and spend time with my grandpa. That would be a summer well spent. My number one summer wish is to sneak out with my best friend. We would do all kinds of things, but the first thing we’d do is go to the park. We would lie down on the grass and stargaze. I would amaze my friend with my knowledge of the constellations. We would have a deep talk. There are only us two, no one else. After the park, we would walk around. We would go to a restaurant and pig out on french fries, burgers, shakes, etc. We would talk as we stuffed ourselves. During this sneak out, we would take massive amounts of pictures. They would be the perfect memories of that night. My BFF and I would take as many goofy pictures as we want. A sneak out would be on the top of my summer wish list. Just think about the suspense all throughout the night. Think of all the laughs. A sneak out would be so fun! Next essay contest: What’s the best present you’ve gotten? Some of the best presents aren’t the most expensive. The best gifts are usually the ones you really wanted or are the most thoughtful or come from someone special. We want to know, what’s the best present you’ve gotten? Maybe it was a birthday or Christmas present, or something unexpected. Maybe the person spent money on it or maybe it cost nothing at all. It could be store bought or homemade. Tell us what the gift was and why it meant so much to you. Why was it the best present you’ve gotten? Essays should be a page or more. Include your name, school, age and phone number with your essay. The staff of L.A. Youth will read the entries and pick three winners.Your name will be withheld if you request it. The first-place winner will receive $50. The second-place winner will get $30 and the third-place winner will receive $20. Winning essays will be printed in our September issue and posted on layouth.com.